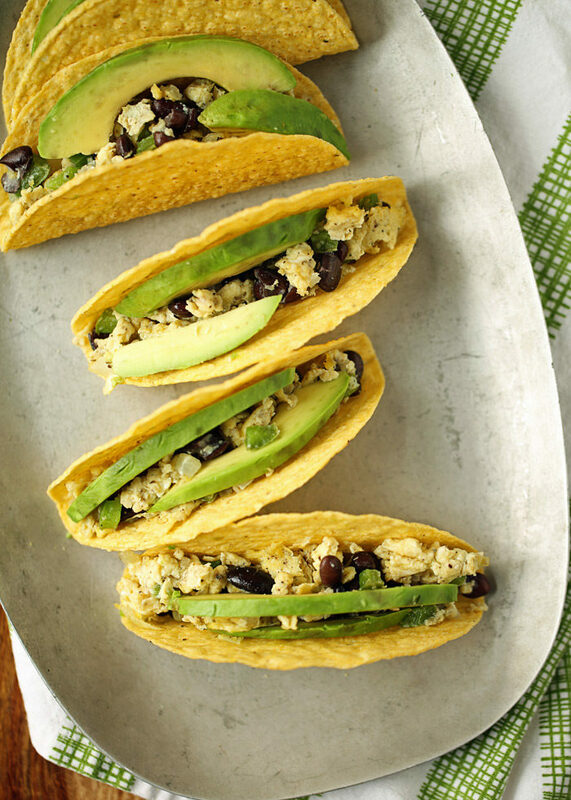 Scrambled eggs flecked with veggies and black beans, stuffed into a crunchy taco shell and topped with creamy avocado. Grab and go deliciousness that’s ready in 10 minutes! Say helloooo to the ultimate grab-and-go meal! Protein, check. Healthy fat, check. Crunchy shell, check. Happy belly, check. This actually started out – at least in my mind – as a breakfast burrito recipe. Safeway and Old El Paso asked me to create an easy weeknight meal for back to school, and for me, breakfast for dinner is one of the easiest dinner themes of all. But burritos went by the wayside pretty quickly. 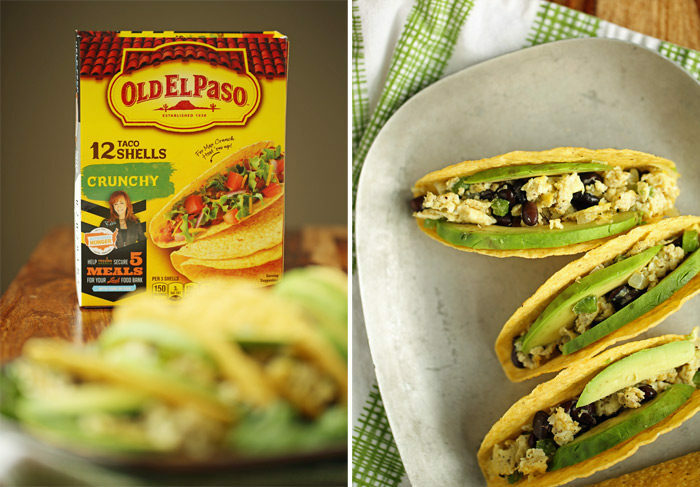 Because when I saw these Old El Paso crunchy taco shells on display at my local Safeway, I knew I just had to create something with those instead. 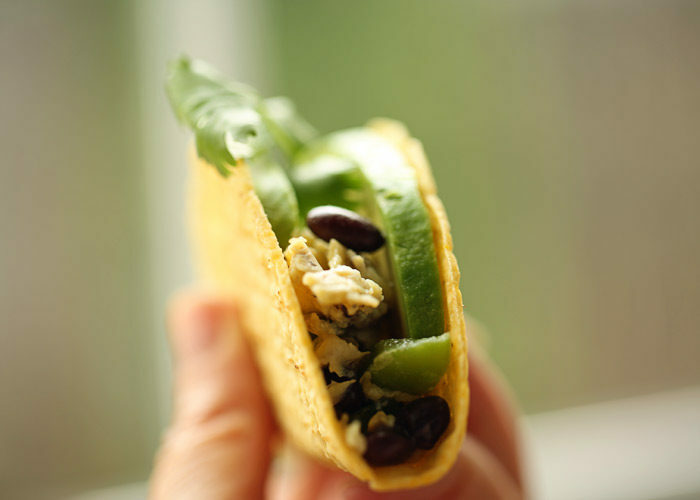 Black Bean & Avocado Breakfast Tacos were born! These things are so easy. All you do is cook up some simple veggies, scramble in the eggs, and stir in some black beans. 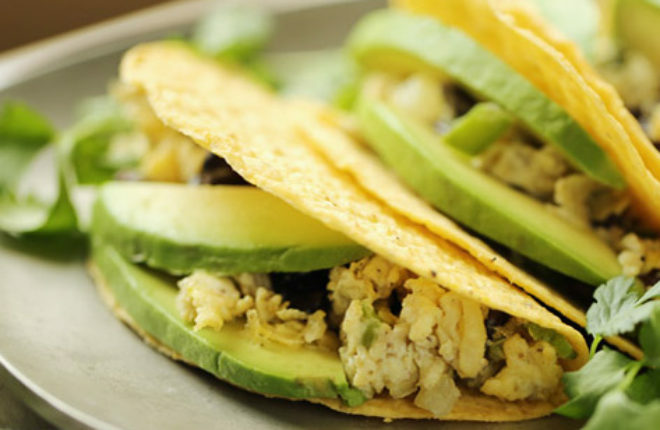 Fill your taco shells with the scrambled egg mixture and top with a couple of creamy avocado slices. Then chomp and enjoy! They’re awesomely portable, so you and the kids can just grab one or two on the way out the door to school in the morning or before evening soccer practice. Plus, only about 10 minutes to cook and assemble. For real! 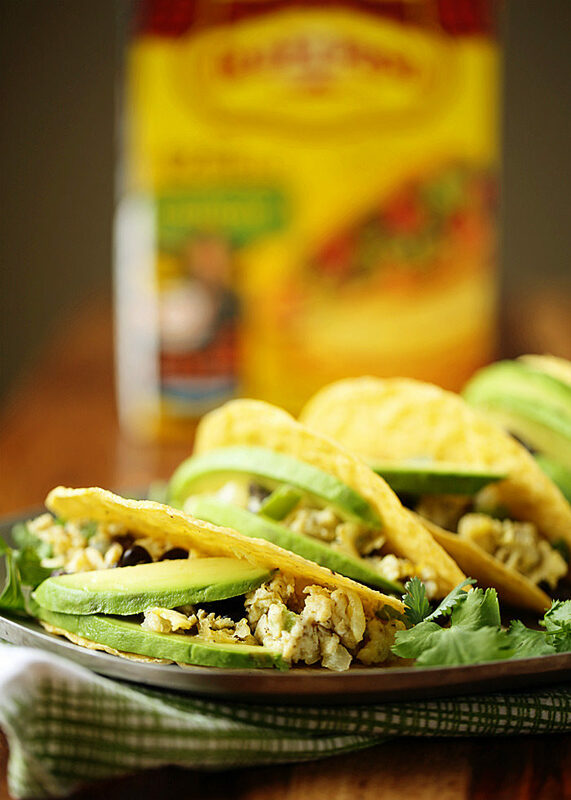 These breakfast tacos are great for customizing to individual tastes too. Add a little cheddar or pepper jack for cheese lovers. Crumble in a little cooked sausage or bacon for the carnivores. Drizzle with hot sauce or salsa for added zip. The world is your taco! 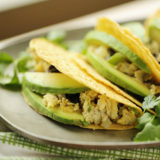 And after you use your taco shells for this recipe, don’t throw away the box! Clip the Box Tops on your Old El Paso packaging, and on other General Mills products, to earn 10 cents each for your schools (see more info below). Set a medium saute pan over medium haet. When hot, add the olive oil. Add the onion and green pepper and saute until soft, 4-5 minutes. Crack the eggs into a medium bowl and whisk until well-beaten. Pour over the veggies and cook, stirring frequently, until scrambled, 1-2 minutes. Stir in the black beans. Taste and add additional salt and pepper if desired. Divide the mixture between the 8 shells. Add any additional toppings if you like, then top with avocado slices. Serve. Add your favorite cheese either along with the beans or sprinkled on top after you stuff your shells. Cheddar and pepper jack are excellent. Add cooked crumbled bacon or sausage. Only Box Tops For Education registered schools can redeem Box Tops. Each Box Top is worth 10 cents to redeeming school. Limit $20,000 per school, per school year for Box Tops redeemed through the Clip Program. See www.boxtops4education.com for program details. This is a sponsored post that I wrote for Albertsons Safeway and Old El Paso. Thank you for supporting the companies that help support Kitchen Treaty!